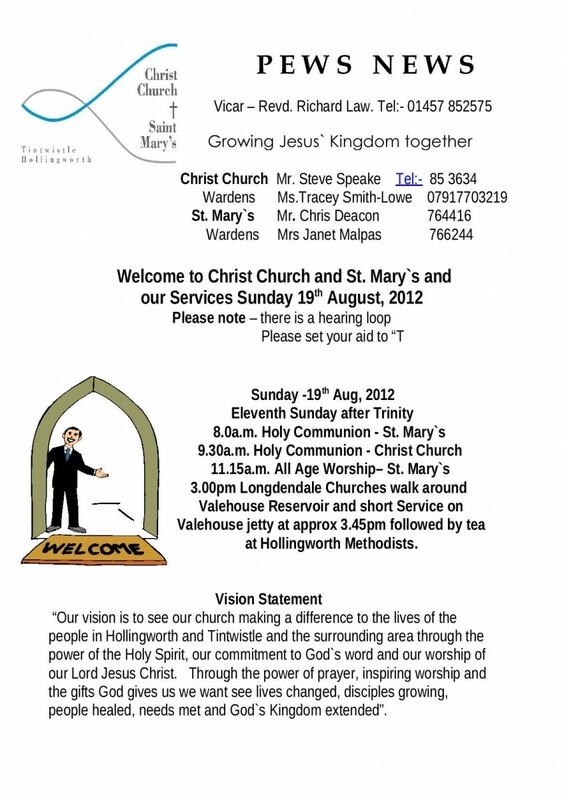 The pews news is the weekly notices sheet for St Mary's Hollingworth and Christ Church Tintwistle. On it you will find details of our Sunday Services, the events that are on during the week, prayer requests and general notices particularly about forthcoming events. It is normally updated every Saturday. The Honeycomb is our monthly newsletter with articles about forthcoming events, follow up from previous events, details of what is on this month and other articles of interest. It is free and can be delivered to anyone in Hollingworth who requests a copy or downloaded from this website. accepted at the Annual Meeting of St Mary's Church (Annual Parocial Church Meeting APCM). This meeting is normally held during April and the Annual Report gives details of the activities of St Mary's Church over the previous calender year. Draft copies of this report are made available to evervone who is on the Electoral Roll of the church and the final version can be downloaded here.